Gateway Arch (looking north), Jefferson National Expansion Memorial, 1985. The Gateway Arch is a massive stainless steel structure that towers 630 feet above the surrounding landscape. To the east of the Arch is the Mississippi River. Curvilinear, graceful staircases of toned concrete at the north and south ends provide access to the Arch grounds from the riverfront. The grounds themselves are carefully landscaped with ponds, trees, and walkways that again reflect the gentle curve of the Arch. Similar curves are repeated in the tunnel entrances for the railroad tracks that cut through the property. The design of the concrete tunnel entrances is so finely incorporated into the landscape through the curvilinear lines and placement below grade that the entrances hardly seem to exist. To the west of the Arch (across two major streets) is the Old Courthouse, whose dome lines up in an east-west axis with the Arch. The original design envisioned a grander axis going several blocks west of the Old Courthouse. Dominating the landscape is Eero Saarinen's 630-foot stainless steel Arch constructed in the form of an inverted catenary--the curve formed by a chain or flexible cord hung between two points. Saarinen's design, however, is more complex and subtle than the pure geometric form of a catenary. Instead, the imaginary chain has heavier links on its ends with progressively smaller links toward its apex, making its shape rounder than a pure catenary. The Arch was built in triangular sections and, like the weighted catenary chain, has larger sections at the base and progressively smaller sections at the apex. Each section is a double-walled equilateral triangle of carbon steel on the interior and stainless steel on the exterior held together by welded high strength steel rods. The small spaces between the double walls of the triangular sections are filled with concrete up to the 300-foot level. In turn, each triangular section is welded to the one above it. Thus the structural framework frame is the steel and concrete skin itself. Inside the two legs of the Arch are "trains" that transport visitors to the top of the Arch. Each train is made up of eight capsule-type cars that are round in cross-section. Each car seats five people and carries them up to the small observation room at the top of the Arch. The cars are equipped with leveling devices that adjust the angle of the capsule as it climbs up the leg of the arch. The observation room (7'x65') has rectangular windows that afford long distance views to the east and west--the Illinois and Missouri sides. The windows are cut in at an angle so that the viewer can look 630 feet directly below him to the base of the Arch. Also inside the legs of the Arch are staircases used for maintenance of the trains and as emergency exits. Entrance ramps at the north and south bases of the Arch lead down into the subterranean visitor center and Museum of Westward Expansion, finished in 1976. Inside, a large pool is centered at the core directly below the apex of the Arch. The pool was added in recent years. Most of the square footage below ground is taken up by the museum. Some area is used for administrative offices and for mechanical systems. Alterations to both the site and the Arch itself have been minor. Carpeting was laid in the observation room to decrease noise levels. Some alterations were done to the heating, ventilating and air conditioning (HVAC) system at the north end of the Arch, but these were required for maintenance. The ramp payers at the north and south entrances are scheduled for replacement with a less slippery stone in the near future as a safety measure. Vandals have scratched grafitti (names, obscenities, dates, towns) in the lowest stainless steel panels. Methods of treatment for returning the surface to the original polished condition are under study. There have been a few minor changes in interior partitions in the administrative office spaces. Other than those changes, the building is in excellent condition and retains extremely high architectural integrity. The Gateway Arch is unique in American architecture. The Arch is the largest monument in the United States--larger than the Washington Monument or the Statue of Liberty. Its structural system had never been attempted before on so massive a scale. Its highly complex and subtle design based on a weighted catenary is unique in architecture. The Arch is a symbolic architectural expression of such simplicity and modernity that even today, thirty-eight years after the design was accepted for construction, it still seems avant-garde. Also, the Arch was the first major design that architect Eero Saarinen did on his own during his highly creative career. The Arch is the design and planning focal point for the urban landscape of downtown St. Louis. The structure has become the unofficial logo for the city and is the area's chief tourist attraction. The design competition for an appropriate memorial for Jefferson National Expansion National Historic Site brought out a range of submissions from top post-war architectural firms to small-town architects with minimal experience. An analysis of the submissions is a convenient window into the tastes and design theories prevalent in American architecture after World War II. Jefferson National Expansion Memorial National Historic Site was established by President Franklin D. Roosevelt in 1935 to memorialize the role of Thomas Jefferson and others responsible for the nation's territorial expansion to the west. The impetus to establish the park had come primarily from citizens of St. Louis--particularly attorney and civic leader Luther Ely Smith--who felt that the city's importance in the settling of the west should not go unrecognized. In their eyes the development of a park area also meant revitalization of the deteriorating riverfront. The National Park Service oversaw the demolition of about 40 city blocks on the waterfront along the Mississippi River to the east of the Old Courthouse (where the first two trials in the Dred Scott case were held) in preparation for construction of some sort of memorial befitting the significance of the historic site. Demolition of the buildings was completed in 1942. The start of World War II brought to a quick halt any immediate prospects for development. Following the war, private monies were raised to finance a two-phase architectural competition to select the most appropriate design that would symbolize St. Louis' role as the gateway to the west. Out of 172 entries, Eero Saarinen's design for a stainless-steel arch soaring 630 feet above the ground was chosen. George Howe, innovative architect of the Philadelphia Savings Fund Society building, was the professional advisor for the competition and wrote the architectural program. The design competition for the Memorial attracted some of the biggest names in American architecture at the time. The list included the following: Charles and Ray Eames and John Entenza; The Architects Collaborative (Benjamin Thompson, Jean Bodman Fletcher, Norman Fletcher, John C. Harkness, Sarah Harkness, Walter Gropius, Robert S. McMillen, Luis A. McMillen and Leonard Currie); Harrison and Abramovitz; Louis Kahn; Saarinen, Saarinen and Associates (Eliel and Eero both entered from the same firm); Skidmore, Owings and Merrill; Edward Durrell Stone; Hugh Stubbins; Harry and John Weese; Smith, Hinchman & Grylls and Minoru Yamasaki. Of the 172 entries, most were from smaller architectural firms. President Dwight D. Eisenhower signed the public law authorizing the construction of the Arch, and an additional law matching $3 of federal monies to $1 of city monies provided. In 1959 groundbreaking began. First items on the agenda were relocating some of the railroad tracks that traverse the property and excavating for the foundations. The contract for constructing the Arch and shell of the subterranean visitor center was awarded to MacDonald Construction Company of St. Louis in 1962. Next the National Park Service signed a cooperative agreement with the Bi-State Development Agency to operate a transportation system in the Arch. 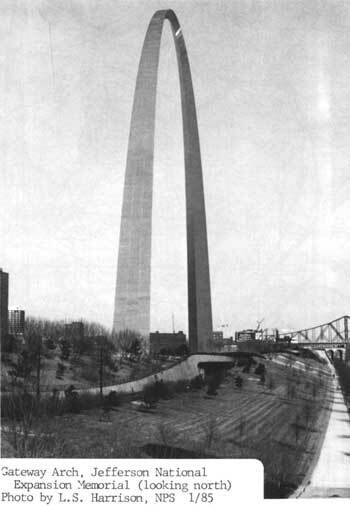 The first triangular stainless steel section of the Arch was set in place on February 12, 1963. The exterior shell was completed on October 28, 1965. Shortly afterwards an interim museum opened pending completion of the Museum of Westward Expansion in 1976. The north-leg transporter opened to the public in 1967, and the south-leg transporter one year later. The formal dedication of the Arch by Vice-President Hubert Humphrey and Secretary of the Interior Stewart Udall took place on May 25, 1968. Paving of walkways and overlooks and construction of the grand staircase from the Arch down to Wharf Street on the River was completed by 1976, the same year that the subterranean Museum of Westward Expansion opened. Saarinen employed not only unusual design and structural techniques in the Arch, but also innovative construction techniques. Saarinen originally conceived the Arch as being thinner at the top than at its bases so that the form would seem to soar toward the heavens. He experimented with two catenaries--one inside the other--for the intrados (inside) and extrados (outside) of the Arch, but he was dissatisfied with the sculptural appearance feeling that it was too severe. Saarinen and his associates ended up choosing a weighted catenary (with bases heavier than apex) that could be seen only as an imaginary line going through the center of the Arch. Thus, neither the extrados nor the intrados of the arch was a catenary. That choice was rooted in the type of visual logic the Greeks used in their architecture--where appearance took precedence over precise mathematical logic of architectural forms. The use of a stressed metal skin in the Arch allowed the skin to carry all of the structural loads eliminating massive interior framing. Saarinen used a similar structural approach, but in reinforced concrete in his TWA terminal at John F. Kennedy Airport in New York. The new construction techniques included the use of 100-ton creeper cranes mounted on steel tracks on each leg of the Arch. The cranes lifted and placed each of the triangular steel sections until the final section was put in place topping off the arch. The cranes then went back down each of the respective legs polishing the finished surface, while the tracks were removed simultaneously. Eero Saarinen was born in Kirkkonummi, Finland, in 1910, the son of architect Eliel Saarinen. Eero came to the United States with his family in 1923 when his father was teaching at Cranbrook Academy in Bloomfield Hills, Michigan. Eero studied sculpture in Paris, and received a degree in architecture from Yale University. He went into partnership with his father in 1937 (who had won second prize in the Chicago Tribune Tower competition), and then took over management of the firm after his father's death in 1950. Eero Saarinen died of a cerebral hemorrhage in 1961, two years before the first stainless steel section of the Arch was hoisted into place. Other buildings Saarinen designed include the General Motors Technical Center (1955); Kresge Auditorium at Massachusetts Institute of Technology (1955); Ingalls Hockey Rink at Yale University (1958); the TWA Terminal at John F. Kennedy Airport, New York; Dulles Airport at Chantilly, Virginia; and Morse and Stiles Residential Colleges at Yale University. Eero Saarinen is famous for his highly expressive designs and brilliantly innovative structural techniques such as his use of a stressed skin of stainless steel in the St. Louis Arch. Saarinen's Gateway Arch is a monument of twentieth-century architecture. It is a simple, yet powerfully symbolic architectural gesture. Saarinen once commented: "The only architecture which interests me is architecture as fine art. That is what I want to pursue. I hope some of my buildings will have lasting truths. I admit frankly that I would like a place in architectural history." Saarinen succeeded in attaining that place. 1. "Eero Saarinen," Architecture and Urbanism, April 1984 Extra Edition (Tokyo: A&U Publishing Company, Ltd., 1984), p. 220. 3. "What Might Have Been" videotape (St. Louis: First Street Forum/Inner Vision Productions, 1984). 4. Charles Jencks, Modern Movements in Architecture (Baltimore: Penguin Books, 1973), p. 197. Brown, Sharon. Administrative History: Jefferson National Expansion Memorial National Historic Site. St. Louis: National Park Service, Jefferson National Expansion Memorial National Historic Site, 1985. Brown, Sharon. "Jefferson National Expansion Memorial: The 1947-48 Competition," Gateway Heritage (Quarterly Journal of the Missouri Historical Society), Vol. I, No. 3 (Winter, 1980), 40-48. "Eero Saarinen, Architecture and Urbanism, April 1984 Extra Edition. Tokyo: A&U Publishing Company, Ltd., 1984. Heyer, Paul. Architects on Architecture: New Directions in America. New York: Walker and Company, 1966. Jencks, Charles. Modern Movements in Architecture. Baltimore: Penguin Books, 1973. Porter, E.F. "The Catenary Is Only In Its Soul," St. Louis Post-Dispatch, August 22, 1982, 5F. "What Might Have Been." Videotape by Innervision, First Street Forum Gallery, 1984. The Boundary is shown as the heavy dotted line on the enclosed Park Planning Map (omitted from on-line edition).